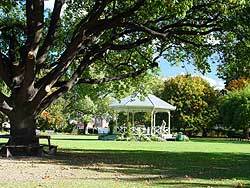 Rangiora, 27km north of Christchurch, in the heart of Waimakariri District, is a bustling town, well known for its country atmosphere and shopping. The town is the nucleus of a very prosperous agricultural, horticultural, fruit-growing, forestry and mixed farming area. Orchard and farm tours operate from Christchurch to this area. Vineyards, olive groves and racing stables, boasting famous names, are further rural attractions. Rangiora means ‘Day of peace’ in Maori, signifying an early inter-tribal pact. The area was first farmed in the 1850’s, when extensive stands of native bush were felled and the land cleared. The first permanent settler was Charles Torlesse. During the 1860’s a number of swamps around the town site were drained and a road link to Christchurch was formed. 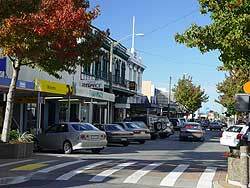 Rangiora’s population of 10,000 people, enjoy a mild climate, low rainfall and a smog-free atmosphere. They claim to rival Nelson’s 2,500 sunshine hours each year. Residents and visitors alike can enjoy a great variety of sporting and recreational activities. Plunge into an Olympic swimming pool, take leisurely garden tours, picnic in Victoria Park, mountain bike in the nearby Ashley Forest, visit the county race track, play golf and study the social history at Northbrook Museum. The strong sense of community here is evident in the town centre. Colonial buildings are well preserved in the shopping precincts. There are great places to meet and eat with quality, a la carte dining, sidewalk cafes and pleasant parks. Local produce is featured in menus including wine, cheese, truffles, saffron and world-famous mead. Places to stay include hotels, motels, country lodges set in stately surroundings, B&B’s, homestays, holiday parks and backpacker hostels. 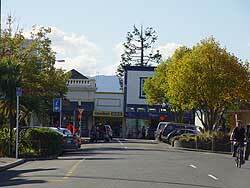 Rangiora possesses all the material advantages of a satellite lifestyle town. Take the time to get acquainted with this delightful rural centre.